Definitely not the first sighting we've seen with this handset, especially when US Cellular launched it back in May, but Cricket is following in the same footsteps as they're adding the Samsung Messager Touch to their lineup. 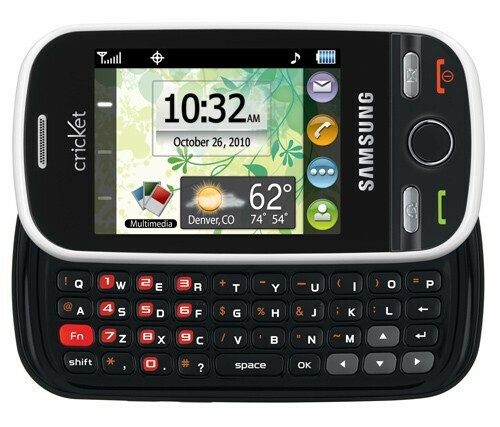 This basic handset packs a 2.6” touchscreen, 2-megapixel camera, and an obvious landscape sliding QWERTY keyboard. Without a doubt it may prove to be a worthy solution to the budget conscious individual out there primarily due to the fact that it doesn't require you to sign a lengthy contract. However, its price point of $159 definitely catapults it to the upper-end of Cricket's offering – but is definitely justifiable when you factor in US Cellular's price of $49.95 with a contract. On a brighter note, purchasing it online as opposed to in-store will drop the price by $20 which would bring its final tally to $139.99. can you send more news about cellphones, and keep up with the latest news. Thank you. I want this phone but I am confused.Everyone else tells me its $200.How much is it really?